Adorable Expressions: Poison Apple Books! Right now Vampires, Gouls, Ghosts and more are what kids want to read right now but some books just have a little too much of the 'other' stuff we don't want them to be exposed to just yet. The books are just like the Candy Apple books - preteen/teen approved, just with a twist and an add of gothicness :) Just what kids are wanting and what mom would be ok with them reading. Casey Slater had her summer all planned out. She and her best friend knew what they would be doing all summer long and they would be doing it together. Then a few weeks before the end of school her parents tell her they have a surprise. Her parents bought a house in the middle of nowhere in New Hampshire, just outside Stillness. Her parents plan to restore this old creaky and creepy house. Everyone in town believes the house is haunted and soon so does Casey. She finds the diary from a girl who lived there 70 years earlier, Millicent Amelia Hughes, and while reading the journal, finds out Millicent's story and her own apprehension of being haunted are eerily similar. China cabinets fall over, vases explode, and all the electrical devices go on before the house has power. These and other events lead Casey to believe the house is haunted, and that maybe Millicent is out to get her. But things are not always as they appear. To quote the back of the book: "Casey thought she'd be dying of boredom, but now she's scared to death!" Casey has her entire summer planned, her best friend and her are going to party it up, sleepovers and all. Her parents have it planned too - in a summer home they just bought in New Hampshire - far away from her city apartment and her best friend - for the ENTIRE summer. Spooky things happen in the house, she befriends a boy named Erik who lives in the small town - they spend time together solving the mystery of the house and the diary she finds. Took me 2hrs to read it with interruptions. Its good, little scary parts for teens but that's why they are reading it right? Normal teen stuff, all appropriate. It did teach a lesson - to have courage on your own without having to have backup - which was a nice added feature. It did rush through the best parts but as an adult I want more to sink my teeth into, as Amber was perfectly happy with it. 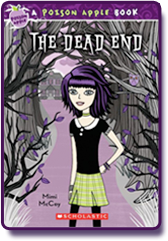 No hanging ending either - I think this is going to be a great series for Scholastic to have! More Poison Apples please! !